Preheat oven to 375 and spray olive oil in your pan to prevent sticking. Mix together oats, quinoa, half of walnuts, baking powder, cinnamon and salt. In a separate bowl lightly beat eggs and add in milk, vanilla, maple extract, maple syrup and half of the slightly cooled butter. Place banana slices on the bottom of the prepared pan. Top with ⅔ of the cranberries and cover with oat mixture. Pour wet ingredients over and make sure the dry ingredients are covered. 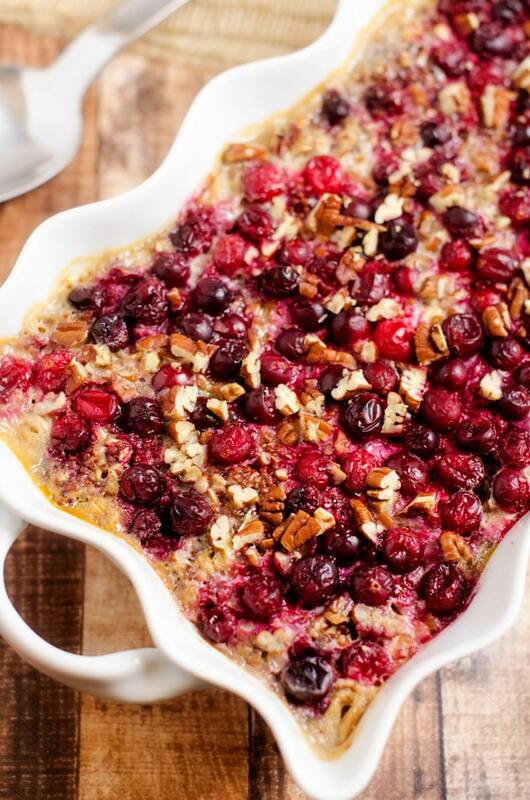 Top with remaining cranberries and walnuts. Bake for 60 minutes. Drizzle with remaining melted butter and additional maple syrup or sugar if desired.